Counter-intelligence agents of Ukraine's SBU State Security Service have identified a native of Crimea who was enlisted by Russian special services to gather information about Ukraine's Armed Forces in Kherson region. 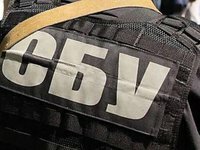 The SBU's press center on Monday said it had established that agents of Russia's Federal Security Service (FSB) in Sevastopol enlisted a Crimea native, given the nom de guerre Night (Noch). His mission was to collect and report information about the locations of Ukrainian army equipment in Kherson region, members of the Right Sector volunteer organization and leaders of Crimean Tatars belonging to the Asker association and Chelebidzhikhan volunteer battalion. SBU agents documented that the involvement of the Ukrainian to confidential cooperation to the detriment of the state security of Ukraine occurred during his departure to Russia-occupied Crimea. Russian special services compromised the person, in addition to using physical and psychological pressure against the person and threatening the person's family. Russian agents forced the person to testify falsely about alleged preparations of Ukrainian socio-political organizations in Crimea. A criminal case has been opened under Article 111 (high treason) of Ukraine's Criminal Code.